Since Paul Barford’s discovery and the consequent legal questions for Craig Gottlieb, ClearStory, National Geographic Channels International and the Fox Entertainment Group, I’ve found more evidence of Craig Gottlieb’s looting, smuggling and illicit sale, and documented a longer history of questionable activity. Latvian law requires newly-discovered antiquities to be reported to the state, which then decides upon the antiquities’ registration and state protection. Whether or not they are state-protected, it is ‘prohibited to export cultural monuments from the Republic of Latvia’. Polish law maintains ‘state ownership of all archaeological finds’, ‘forbids any amateur search for artefacts, either for commercial or for personal use’, ‘prevents the dispersion of collections, prohibits the trade in antiquities, and makes creating private collections of archaeological finds illegal’. No exceptional licences were presented or claimed. On that basis, I characterised apparently contrary activities as illicit activities. Naturally, if such licences are presented, or if an official or expert states that such licences were not necessary in these cases, I will correct my characterisations. 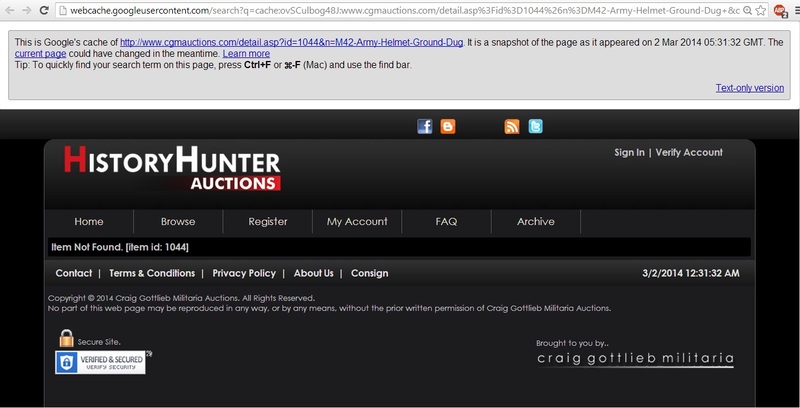 For example, by the 2nd of March 2014, he had sold a ‘ground dug’ German M42 army helmet through History Hunter Auctions. 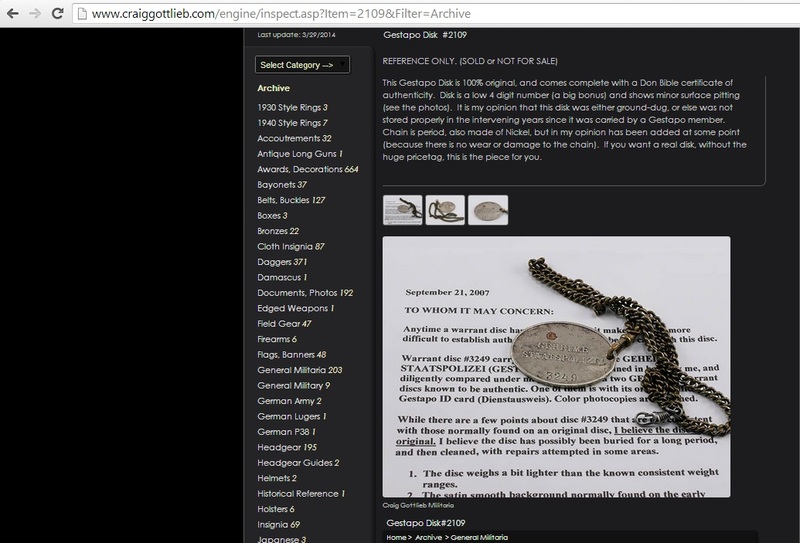 On the 18th of February 2014, Gottlieb posted a ‘ground found digged out [sic]’ ring in the German Daggers forum, which the ‘owner [looter and seller]’ had found in a battlefield near Szczecin in Poland. He continued to ‘find… new and new to buy’ antiquities in Poland at least up until the 6th of March. He has a long history of dealing in questionable material. By 2007, he had acquired Gestapo disk #2109 (‘Reference only. Sold or not for sale.‘), which ‘was either ground-dug, or else was not stored properly in the intervening years since it was carried by a Gestapo member’; the authenticator judged that it was original and had ‘possibly been buried for a long period, and then cleaned’. At least for some of Gottlieb’s objects, there is an alternative explanation: militaria collectors across the web decry him as a ‘false or misleading‘, ‘confirmed liar/fraudster‘; but that “defence” seems implausible for his sideline in looting and/or buying looted dead soldiers’ property from historic battlefields in Latvia and Poland (and perhaps elsewhere). Where else did Nazi War Diggers work for ClearStory, National Geographic Channels International and the Fox Entertainment Group? Barford feels Gottlieb’s exclusive use of old German names for long Polish places is ‘incredibly aggressively revisionist‘. I think it’s ignorant and lazy, indicative of someone who has gone to Poland with a metal detector and an old German map with battlefields marked on it, who doesn’t know and doesn’t care what these places are or even what they were, except for as a seam of antiquities for him to mine. If his defence is that he used Stettin to show that he was at the archaeological site rather than in the city (the same way you might be in Istanbul and write about Constantinople), why did he use Alte Babitz rather than Stare Babice (and only the German name rather than both the German and the Slavic ones)? This Gestapo Disk is 100% original, and comes complete with a Don Bible certificate of authenticity. Disk is a low 4 digit number (a big bonus) and shows minor surface pitting (see the photos). It is my opinion that this disk was either ground-dug, or else was not stored properly in the intervening years since it was carried by a Gestapo member. Chain is period, also made of Nickel, but in my opinion has been added at some point (because there is no wear or damage to the chain). If you want a real disk, without the huge pricetag, this is the piece for you. Doesn’t Germany have an archeological importance law? I’m sure Poland has rather severe restrictions. According to what you posted yesterday, he went as far as to move items to Finland to have them sent to the US from there- so he knows what he’s doing and obviously attempting to circumvent regulations. Side note: A ring marked ALPACA, will most probably be of Spanish or Latin American origin (rather than German), as that’s the Spanish hallmark/word for nickel silver. They do indeed! And I understand that Germany has specific laws concerning this type of material, which may make this even more interesting. Are you the Viktors? I’m dubiously honoured! Where did you get that shell fragment from? Just tell the auction house the item authenticated itself last night. The fact that those paints weren’t produced in the lifetime of the artist is irrelevant as I just know I’m right!